At 2152 meters above the sea, this is the second highest mountain on Bali. It is one of the most popular hiking treks on the island. The summit can be reached in between two and a half to four hours. The path up the mountain is virtually untouched aside from a few shrines. 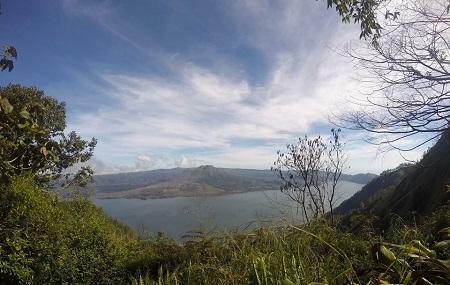 Make sure to visit on a sunny day - you don’t want the view from the top of the lake and Mount Batur to be veiled by clouds. Most people take the trek at the crack of dawn, usually around 3 in the morning, reaching the summit in time for sunrise and breakfast. They also usually have a trek guide. Either way, the trek needs some extensive planning. Drive to the mountain, then hike. Have a tour or trek guide pick you up from your hotel and lead you up the mountain. How popular is Mount Abang? People normally club together Trunyan Cemetery and Bukit Jambul while planning their visit to Mount Abang. Mt Abang is one of the best mountain to climb in Bali for the view. The other is Mt Batur. Actually both of the mountain are located at the same district, result from the great explosion of The Great Mt Batur in the past. The track is quite easy to find without any guide. Back-and-forth journey might take approx 4-6 hours. The view of Mt Batur, Lake Batur and Batur caldera is mesmerizing from the peak.